Home to the Wachesaw Plantation East Golf Course, it's easy to meet lots of other great golfers. Work on your sun-kissed look or go for a relaxing swim. Elegant plantation-style rentals make for a relaxing vacation in Murrells Inlet. Head to the grill pub for a beer and a meal after a day of golfing and fun. Stroll along the resort's nature path, around ponds and moss-covered oaks. 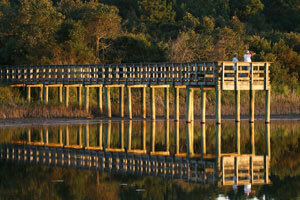 The fishing village of Murrells Inlet is right down the road. Elegant townhome condos are spread out around golf greens, trees, and natural ponds. Festiva’s Ellington at Wachesaw East Resort beautiful golfing resort in the laid-back fishing village of Murrells Inlet. Guests have priority access to the putting green and the Wachesaw Plantation East Golf Course, which won the area’s Best Course of 2007 and was home to the Kathy Ireland City of Hope LPGA Golf Tournament from 1997 to 2000. Stop by your condo to drop off your luggage and get changed into swimsuits. Grab goggles, floaties and pool toys before heading out for a swim. Don’t forget the sunblock! Take your pick between the indoor pool and the outdoor pool. Go for a relaxing swim or relax with that book you’ve been meaning to finish and work on your sun kissed look while the little ones splash around in the children's pool. Thinking burgers for lunch? Recruit the kids to help carry side-dishes and condiments and head for the bbq grills. Let the kids run off their energy (just in time for their afternoon nap!) on the children’s playground. One-bedroom condos sleep four guests. Upgrade to a one-bedroom deluxe for an in-suite washer/dryer. Two- to three-bedroom condos sleep six to ten guests. Two-bedroom deluxe condos offer more space than a traditional two-bedroom. Full kitchens have everything you need to make everyone’s favorites. Stock up on grocers at Food Lion. Recruit the kids to help bake your famous double chocolate brownies (not that they’ll need convincing). The in-suite washer/dryer will come in handy for post-chocolate clean-up. Enjoy a low-key night in thanks to your Flatscreen TV with Cable. Catch a Friends rerun or watch the big game. DVD players are perfect for family movie night. Bring a selection of DVDs from home, call everyone into the living room and ask for a show of hands to decide what to watch first. Don’t forget the snacks. Broadway at the Beach features shopping, dining and attractions. Surprise the kids with a stop at Build-a-Bear where they can make their own stuffed animal. Create your own unique piece of jewelry at Pick a Pearl. Get a new cell phone case at MAXii Electronics. Now every time you look at your phone you'll be reminded of your Myrtle Beach vacation. Hungry? Extreme Pizza, Señor Frog’s and Joe’s Crab Shack are just a few of your options. Attractions include Dinosaurs The Exhibition with life-size animatronic dinosaurs. Ride a T-Rex or Triceratops at “Ride a Dino.” Ripley’s Aquarium features a 750,000-gallon shark tank, a stingray experience, and glass-bottomed boat rides. Ride the SkyWheel in ultimate comfort thanks to the climate controlled gondolas. Experience the best views of Myrtle Beach at almost two-hundred feet in the air. Little ones will love The Children’s Museum of South Carolina. They can pretend to be a contractor at the Under Construction House, play with water at Water Works and learn about the Scientific Method at the same time (but don’t tell them that! ), or be a bank teller at The Big Bank. - Guests must contact the property ahead of time if planning to arrive after 11:00 PM. For more details contact the property using information on the booking confirmation. - Due to damages received during the hurricane the property is closed until September 28, 2018. Extra-person charges may apply and vary depending on hotel policy. Noise-free rooms are not guaranteed.